The Zodiac G4 automatically keeps your swimming pool pure, clean and wonderful – wall to wall, top to bottom, 24 hours a day. No nuts, bolts, screws, gears or wheels to corrode, your Zodiac G4 is built to last – in fact, the Zodiac G4 is guaranteed with a 2-year warranty. The brand new Zodiac G4 is designed for minimal effort with maximum maintenance. You spend less time and effort keeping the pool clean and have a lot more time to enjoy yourself. The design of the Zodiac G4 reflects Zodiac’s marine expertise it glides easily through the water, picking up dirt and debris smoothly as well as quietly assisting the water circulation. The fins allow the G4 to glide over main drains, lights and return fittings without getting stuck. The rudder directs the G4 to every area of the pool, assisted by these directional strakes, and the Buoy and Keel provide continuous stability and balance. Maintaining your Zodiac G4 is easy as the G4 has an easy to remove Long Life Diaphragm which simply pops out for cleaning no gears, flappers, wheels or noisy hammers. The Zodiac G4 works just as efficiently on concrete, fibreglass, pebblecrete, tiles and vinyl – whatever sort of pool you have, it’ll make your life easier. In fact, right from the moment it arrives, the Zodiac G4 is easy to assemble and install. In Summertime, according to the old song, the living is meant to be easy. 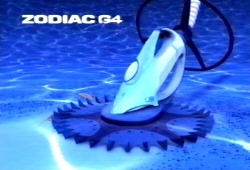 A Zodiac G4 automatic pool cleaner can make that very true for you.